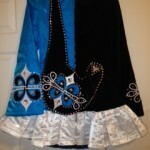 This beautiful dress is made of black micro-velvet and turquoise twinkle satin. 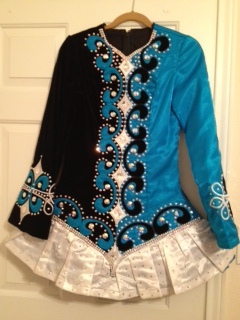 The pictures do not do the blue in this dress justice! It is so vibrant in person. 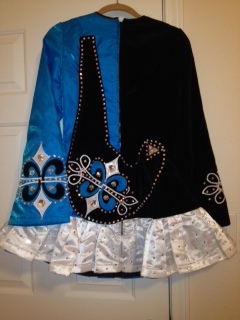 Current dancer is 5′6″ and an Open Champ dancer. Return will be accepted within 3 days of receiving if dress is tried on and doesn’t fit but will consider on a case by case basis. 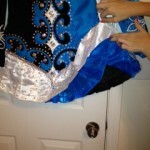 There is a very slight smudge mark on the skirt that is not noticeable when being worn. Can send perspective buyer picture if needed. Buyer responsible for return shipping cost. 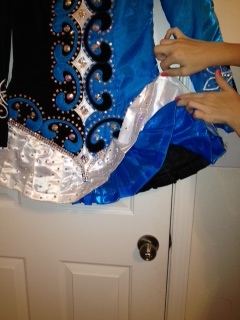 If you would like to see pictures of the dress on the current dancer, please send your name and email. Comes with a headband. Bloomers are not included. Shipping included within US. Paypal only. Dress would ship from Texas. It has 4 inches of let-out in the bodice and up to 5.5 inches of let-down, which can be accomplished by letting down the 2 inch hem in the skirt and/or dropping down the ruffles. Asking Price: $US1135. Shipping costs are included for my own country, overseas shipping is extra. Returns are negotiable.